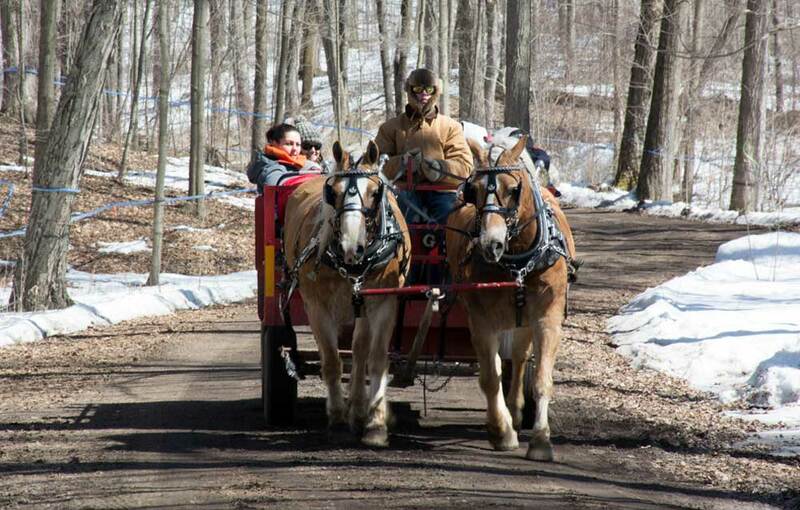 The Purple Woods Maple Syrup Festival saw a bump in attendance numbers this year compared to 2014, according to a report from the Central Lake Ontario Conservation Authority. The Purple Woods Maple Syrup Festival saw its numbers improve this year, but is still below those from years past. According to a report filed by the Central Lake Ontario Conservation Authority (CLOCA), which organizes the festival, 10,454 people attended the festival this year, up from 8,433 last year. This number is still down from 2012 and 2013, which saw 12,547 and 14,466 visitors respectively. For Patricia Lowe, CLOCA’s director of stewardship, education and communication, the biggest factor that decides how well the festival does is one that is out of anyone’s control: the weather. “Good weather, that’s always the number one factor, I think, in our attendance and making sure people have a good time,” she tells The Oshawa Express. The festival’s recent technological upgrades, such as online ticket sales and online inventory records for the Heritage Store, have made things more efficient, Lowe says. For next year and other festivals in the future, Lowe says CLOCA will be broadening its call for volunteers, rather than trying to find everyone in the month or two leading up to it.